Simply Sprout’s Lil Sprouts events are a wonderful way to let your child’s inner artist, thinker, and dreamer shine. Lil Sprouts focuses on educational concepts with a creative twist! June 23rd is National Backyard Campout day so in order to celebrate We will be hosting a backyard campout of our own with educational activities that will get your little ones interested in the great outdoors! Our Lil Sprouts will also be using their math skills to create their own camping snack, be sure to join us! 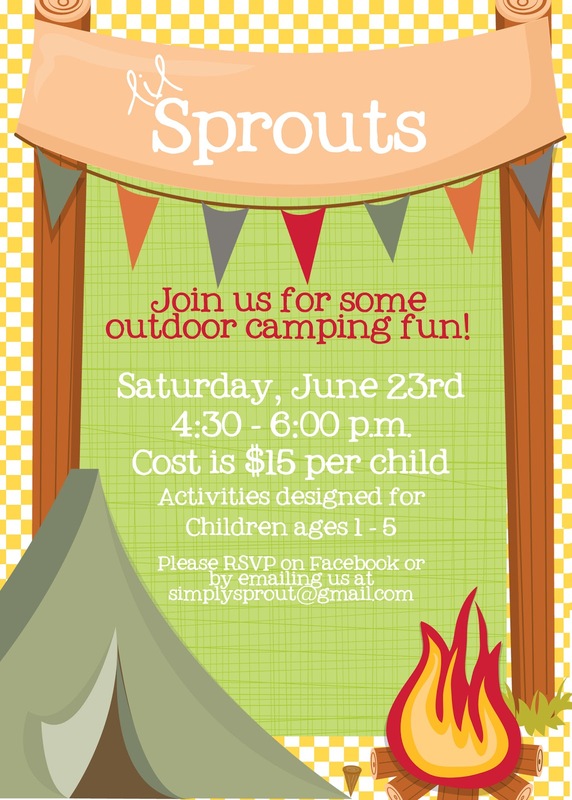 Sign up for this event on our Simply Sprout Facebook page by June 20th. Please only sign up if you intend on coming. We work hard to provide quality materials and instruction to our lil sprouts and to do this we need to rely on an accurate count of participating children. For information on upcoming Lil Sprouts events please contact us at simplysprout@gmail.com.